A fruit is a thing with a name. So a Fruit is really nothing but a pointer containing the address of a Fruit Record. 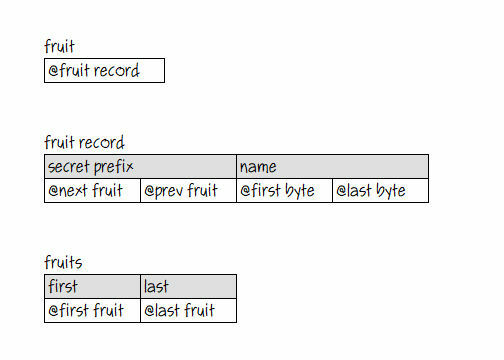 And each 16-byte Fruit Record has a hidden 8-byte prefix with two pointers for linking these records into lists, together with the fruit’s name, which is a string. Plain English strings are stored in the Heap and can be any length. So the Name in the Fruit Record is actually just two pointers to the first and last bytes of the string on the Heap, respectively. String memory is managed automatically, but thing memory is managed by the programmer. The third type generated by the compiler serves as the anchor for lists of Fruit Records. 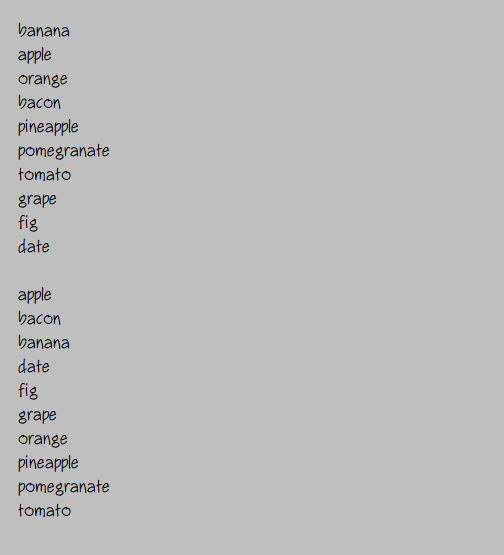 Such lists are simply (and intuitively) called Fruits, the plural of Fruit. Write the fruits on the console. Skip a line on the console. Add “banana” to the fruits. Add “apple” to the fruits. Add “orange” to the fruits. Add “bacon” to the fruits. Add “pineapple” to the fruits. Add “pomegranate” to the fruits. Add “tomato” to the fruits. Add “grape” to the fruits. Add “fig” to the fruits. Add “date” to the fruits. Allocate memory for a fruit. Put the name into the fruit’s name. Append the fruit to the fruits. If the fruits’ first is the fruits’ last, exit. Split the fruits into some left fruits and some right fruits. Put the left fruits’ first into a left fruit. Put the right fruits’ first into a right fruit. If the left fruit is nil, append the right fruits to the fruits; exit. If the right fruit is nil, append the left fruits to the fruits; exit. move the right fruit from the right fruits to the fruits; repeat. Move the left fruit from the left fruits to the fruits. Put 10000 into a count. Create some fruits using “apple” and the count. Start a timer. Sort the fruits. Stop the timer. Write the timer then ” milliseconds for ” then the count on the console. Put 100000 into the count. Create the fruits using “apple” and the count. Start the timer. Sort the fruits. Stop the timer. Put 1000000 into the count. Not quite linear, I admit. But not exponentially bad, either. Ten times as many records take roughly ten times as long to sort. There’s a technical way of saying this using big “O’s” and little “n’s’ and “logs” and stuff, but Plain English programmers don’t generally think that way. And it’s stable, as a Plain English programmer would expect — records with duplicate sort values retain their original sequence.